The Veterans Rural Health Resource Center-Eastern Region (VRHRC-ER), in partnership with the NorthEast Telehealth Resource Center (NETRC), recognizes that widespread adoption of telehealth applications and the proposed increased demand for telehealth services has resulted in a demand for related workforce development initiatives. The needs for workforce development initiatives related to telehealth are varied. One area of need is the unique and essential role of the telepresenter. Over the past year, the VRHRC-ER and the NETRC have developed a curriculum to meet this need. 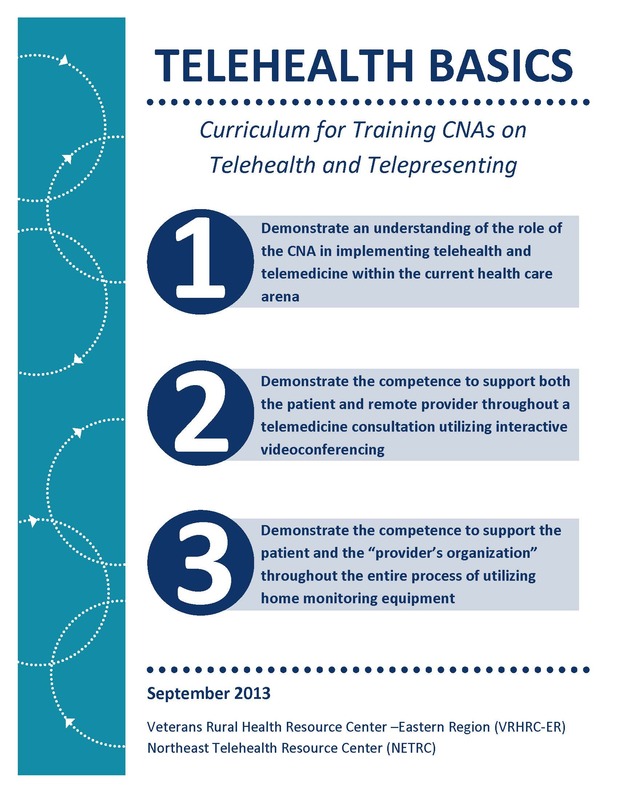 The course provides participants with an introduction to the broad utilization of telehealth applications and a greater understanding of the essential role and skills required of a telepresenter in the delivery of telemedicine services. The methods used to develop and evaluate the curriculum, as well as details of the curriculum’s components, are presented. These components include objective methods healthcare organizations can adopt to prepare their workforce including such as hands-on experience in the operations of equipment and techniques for problem solving equipment issues. The telehealth techniques can be used to prepare health care staff to use telehealth in a variety of health care settings such as nursing home care and home health. The curriculum is a living document which will continue to evolve along with new best practice and guidelines. It is available for download and printing here at no cost. We welcome questions and/or feedback as you use the curriculum within your program. If you would like to talk with us about the curriculum or arrange a training for your team, please contact us!